with its sally and rush. The guilty flee with no one chasing them. Christopher Hopkins, was born and raised in Neath, South Wales, surrounded by machines and mountains, until he moved to Oxford in his early twenties. He currently resides in Canterbury and works for the NHS. 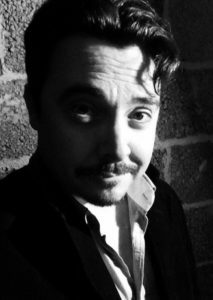 Christopher has had poems published in Rust & Moth, The Journal, Harbinger Asylum, Scarlet Leaf Review, Anti-Heroin Chic, Tuck Magazine, Dissident Voice magazine, Versewrights, Poetry Superhighway and Duane’s PoeTree and the online literary journal 1947. Two of his early e-book pamphlets “Imagination Is My Gun” and “Exit From A Moving Car” are available on Amazon. This entry was posted in Christopher Hopkins and tagged Christopher Hopkins, Outlaw Poetry, Poetry, The old know and the young suspect by Monsieur K.. Bookmark the permalink.